I started with the white sheath and felt like it needed a little extra something when I finished. I decided to add a removable handkerchief peplum. So how do you make a handkerchief peplum? Remember my pencil skirt + removable peplum tutorial here? 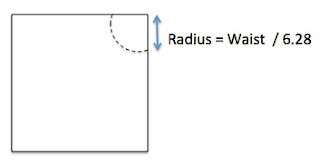 Follow the same instructions to determine the radius for your waist cut-out. Cut out that arc and then hem your edges. Voila, handkerchief peplum! What kind of peplum do you prefer - round, handkerchief, other? That dress looks great on you :) Would you be willing to sell any custom ones without the peplum? Thanks! oh wow! that looks great. i really want a nice colored peplum skirt. it's just so pretty and girly. So pretty!!! I love the peplum dress! I like the other peplum more but this one is unusual (in a good way). Again, I love that you made the peplum separate. The peplum can always be added back when the silhouette is trending again but a sheath is timeless! Oh, my - I absolutely love this dress on you. I personally like it without the peplum, but you can't beat the convertibility of the design. The warm brown accessories and blue stone necklace are perfect! I love all your DIY. This one take my breathe away. I love the dress with and with the peplum. The sihouette is gorgeous and you looks beautiful. OMG that is absolutely GORGEOUS!!! I LOVE LOVE LOVE the white and the style is so stunning! Yet again another reason I really need to learn to sew! I love this creation of yours. I'd buy this sheath dress from you in a heartbeat. Sometimes it's hard to find simple designs in stores without all the useless bells and whistles. I prefer the simplicity of the non-peplum version. It is such a clean, versatile, staple piece, but everyone loves having options. That dress is amazing! I prefer it with peplum also.Loving the statement necklace too. I love this dress both with and without the peplum!! Absolutely gorgeous!! Good job again SPG! You look great on both versions!! What a gorgeous dress! It is so flattering on you and perfect for summer. Love it! love the dress wow! I'm so glad I found your blog, you are so pretty! xO! What a beautifully made dress! I didn't know there were different types of peplums! This is such a great DIY. I've said it before and I'll say it again: you're so talented! The dress is amazing! first of all, you just made yourself a completely tailored white sheath dress. wowza! like it looks store bought. i bet i couldn't go to a store and buy a sheath dress that fits as well. i think the removable peplum is great way to incorporate the trend, but when the trend goes out, you are still left w/an incredible dress. and you coudln't ask for more than that. you always impress me with your talent! I think it's really hard to find the perfect white dress since most of them are see-thru. I really love yours! well done! love this idea, a removable peplum addition is perfect especially when the trend goes out of style. I think I like the dress without peplum. But gah, either way, I love the summer white! Still looking for that perfect dress myself. Did you use a pattern to make the dress, and if so, which one? Thanks! Hi Gem! I used the top from McCall's M5972 and the skirt from B5353. Hope this helps! I have been searching for a white sheath dress for some time now (thanks to Jean) and have yet to find the perfect one yet! Please, please, please post a tutorial on how you made that dress!!! Hi Duckie! The best part is that you don't need a tutorial - just a couple of patterns from the local fabric store - McCall's M5972 and Butterick's B5353 :) Happy sewing!